In this video, This Old House general contractor Tom Silva fixes a fractured foundation. 1. Fill the void inside the concrete block with triple-expanding foam insulation. Wait 10 minutes for the foam to cure. 2. Use hammer and cold chisel to widen crack in wall. Then move outdoors and repeat, widening the crack on the exterior of the wall. 3. Use a drill and mixing paddle to mix mortar and water in a 5-gallon bucket. 4. Add acrylic bonding agent to the mortar and mix again. 5. 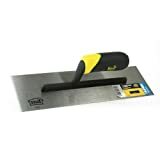 Use a margin trowel to shave off any cured foam protruding from the wall. Then, use the tip of the trowel to push the foam inside the wall. 6. Dampen the wall crack with a wet sponge. 7. Use a margin trowel to force mortar into the crack on the interior and exterior wall surfaces. 8. Smooth the mortar flat to the wall with a flat trowel. Wait about 15 minutes for the mortar to set up. 9. Lightly scrub the mortared surfaces with a damp sponge to create a textured finish. 10. Allow the mortar to cure for two weeks, then paint, if desired, with masonry paint.